You need to get lucky to visit the magnificent Wave formation in Coyote Buttes North, one of the world’s most well-known and surreal landscapes. The Bureau of Land Management (BLM) which manages the Paria Canyon-Vermilion Cliffs Wilderness, issues permits for twenty individuals per day, half by an advance online lottery, and half by a daily on-site lottery. Yet hikers and photographers from all over the world fight for the scarce permits. Therefore you are a winner before even setting foot on the trail. 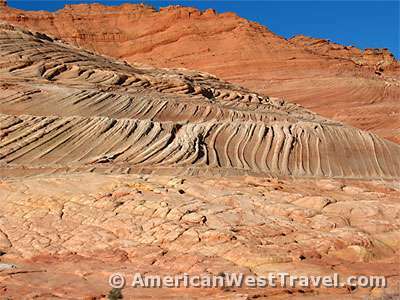 How to obtain BLM Hiking Permits for Coyote Buttes, including “the Wave”. It turns out that getting a mid-winter permit is a bit easier, and we showed up in January at the BLM field office in Kanab, Utah, holding permits for both North Coyote Buttes (the Wave hike) and South Coyote Buttes on consecutive days. (Main road access, trailhead, and most of the trail are in Utah, but the Wave itself is just inside Arizona.) Obviously, there are reasons that winter permits are easier to obtain. The BLM agent informs us that after a major snowstorm and a week of very warm weather, the main access road (House Rock Valley) is a muddy quagmire. Three vehicles had slid off the road the previous day. It’s a dilemma: if you miss your hike due to a muddy road, there are no rain checks or reschedules. You are out of luck. Conversely, the conditions for accessing Coyote Buttes South are improved with damp conditions. During most of the year the network of high-clearance, four-wheel drive roads can be difficult sand traps. The extra moisture packs the sand and makes driving easier. We are scheduled for Coyote Buttes South for the first day and will go through with this trip, then check out the driving conditions to Coyote Buttes North the following day. The day of our Coyote Buttes North trip has broken much colder, well below freezing, and we head out to House Rock Valley Road with the hope that the muddy road will be frozen solid. As we reach the dirt road the temperature hovers around 20°F (-6.7°C) , and the road is indeed frozen. It is most important that the temperature stays cold for the return drive in the afternoon. 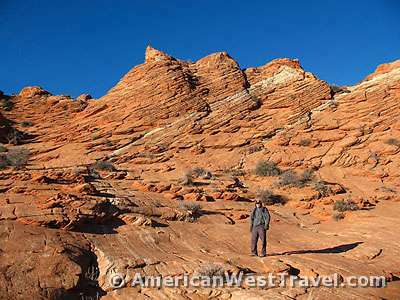 We safely arrive at the Wire Pass Trailhead where trails access both North Coyote Buttes and the equally surreal Buckskin Gulch. We were last at this place in April 1981, when we hiked the Buckskin Gulch and Paria River all the way to Lees Ferry, more than forty miles of very challenging backpacking. Wire Pass Trailhead interpretive sign: You’re about to embark on an unforgettable adventure. 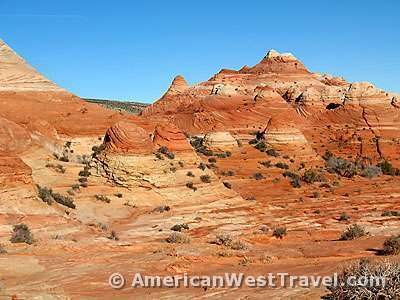 The stunning scenery of Coyotes Buttes attracts hikers from all over the world. Buckskin Gulch is a winding chasm of stone and spectacular cliffs. Either fork will lead you through a fascinating geologic story. From this trailhead, you can access two separate destinations: Buckskin Gulch, or Coyote Buttes and the Wave. As we prepared to leave the Wire Pass Trailhead and hike to the Wave, the temperature was a brisk 21°F (-6.1°C). However the bright sun and very dry air made it reasonably comfortable. I dressed in layers, four over shirts, plus hat and gloves, to shed later as the day warmed. There was no official trail after passing through a fence a short distance down Coyote Wash. 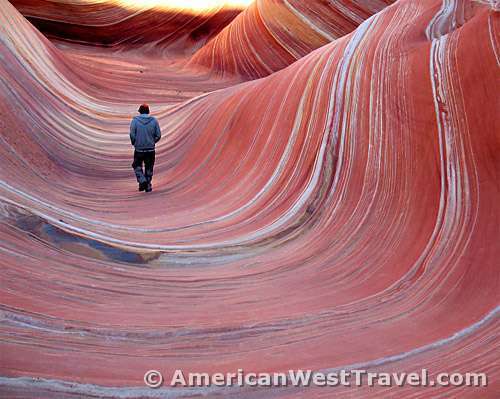 The BLM provided a guide sheet with a number of photos and directions to the Wave. We also carried topographic quad maps and a compass. It turned out that there were many footprints in the sandy areas and rock cairns (small piles of stone left by people, indicating a trail) on the slickrock (ground consisting of sandstone, not soil or sand). However the BLM literature claims that rangers periodically dismantle the informal cairns to preserve the wilderness character of the area. In any case, the provided directions were easy to follow. After shortly climbing out of the wash, the route passed through a nondescript, sandy desert with the obvious ridge line of sandstone formations about a mile distant. Soon we cross a wash and climb through a small saddle in the ridge, entering a completely different world, one entirely of rock. The ground beneath our feet is entirely slickrock, and bizarre, multihued formations abound. The early morning sunlight enhances the colours. Stone teepees dominate the rocky hillsides which are cross-bedded in an endless variety of patterns. One huge cross-bed resembles a fossilized skeleton of a whale or some huge animal.